The Nature Artists’ Guild annual “Nature Artist Trio” presentation is one of our most popular and well-attended programs each year! From 7 until 9 pm on Thursday, August 7, 2014, each of three talented artists will share tips and techniques of their unique artwork process. This is a great opportunity for our members and visitors to learn some basics of a type of artwork they may never have tried before. Since attendees are divided into three smaller groups which rotate between presentations, it is a chance to get an up-close and often hands-on look at the techniques and materials. Each presentation is like a mini-class! This year, we are featuring the talents of Peggy McGahan, Mary Ann Jimenez, and Charlotte Doyle Leavitt. 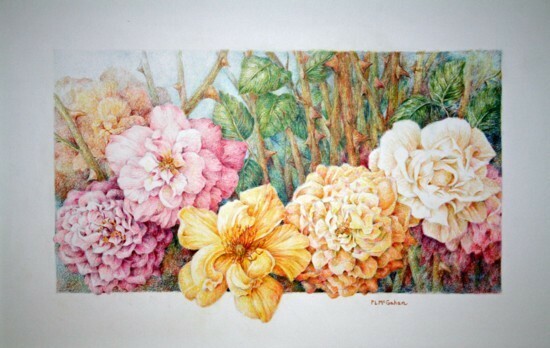 Peggy McGahan will be sharing some unique methods for ” adding water to colored pencil in different ways, including using water-soluble colored pencil, using water-soluble crayons, and combining water-color paints with colored pencils”. Sounds intriguing! You can see more of her work by clicking on this link to Peggy’s website. Mary Ann Jimenez will be working with silverpoint, a fascinating type of ancient drawing which is currently experiencing a revival. Wikipedia explains that “The initial marks of silverpoint appear grey as other metalpoints, but silverpoint lines, when exposed to air, tarnish to a warm brown tone. ” It is a delicate and subtly beautiful form of artwork. 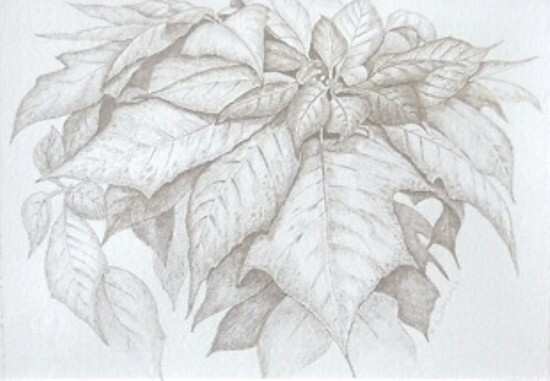 Mary Ann is a member of The Society of Metalpoint Artists. Charlotte Doyle Leavitt is one of our most talented watercolorist members, but it appears that she will be mixing things up for this presentation, and working on collage featuring some of those watercolor images. We are looking forward to seeing what creative techniques she has been working on! We welcome visitors and guests to this informal and fun meeting, and it is a wonderful chance to meet and talk with some of our Nature Artists’ Guild members. There is no charge for attendance or parking, so just let the gate attendant know you are there for the Nature Artists’ Guild meeting and you will be directed to Thornhill.